Changing what you drink just may be the magic weight loss bullet you’ve been looking for. By the way, our group fitness bootcamps Etobicoke workouts are amazing! I’m always available to help – call Fit 1 Bootcamp or reply to this email to set up your free consultation. 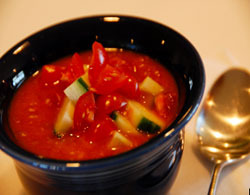 Gazpacho is a cold tomato-based soup that originated in Spain. What better time to enjoy a chilled bowl of gazpacho than on a hot summer day? Use fresh ingredients for the best possible taste. Share how our Fitness Bootcamps Etobicoke suggests these drinks.